This month we’re partnering with 02L > Outside Standing Level to bring you the 5 Buttons Competition. Submit your game between now and January 31st, 11:59 PST to have the opportunity to have your game displayed at the Stattbad Gallery in beautiful Berlin, Germany. Unlike previous competitions, however, there is a bit of a twist: games will run on 02L > Outside Standing Level’s Unita Zero platform, an audio/visual playground made up of 5 pressure pads hooked up to a projector and audio system. Exciting, eh? Of course, €1200 is a lovely incentive, but more realistically this is a great opportunity for EGP-ers to get our games played on a big canvas. 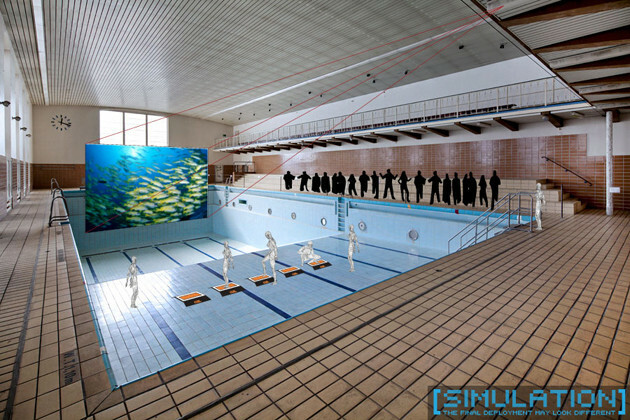 A big canvas in a swimming pool. Hooked up to a sound system. In an art gallery in Germany. What's not to love? Even though I'm busier than I've ever been, this is far, far too exciting a prospect to pass up. The EGP themes are usually pretty broad, and often this is the factor that holds me back: a completely blank slate is often quite daunting, and I usually have trouble settling on one idea. However, this contest has a slightly more defined ruleset and conditions, which I think/hope will mean that I can be a little more focussed in my approach. The setting of the project has made me mentally rule out single player games. In this kind of environment the whole point I think is to engage groups of people, be that spectators or players. Going onward from that decision it's then down to considering how the group of players interact: are they playing against each other, or as a team? Again, my gut reaction given the setting would be to lean towards collaborative play. I'm certainly not ruling anything out at this stage, but my focus in getting ideas down will definitely be more along the lines of bringing users together into one gameplay experience; I love the idea of teams working together, and what's more it's a really novel way to explore multiplayer gaming in a pretty unique setting. Needless to say, I'm excited. Expect more soon on this!